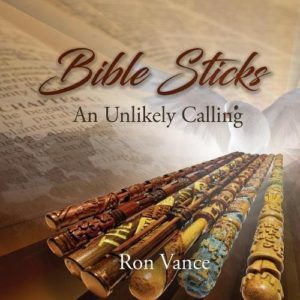 Bible Sticks: An Unlikely Calling by Ron Vance is an absolutely beautiful book. I was enthralled by it. Author Ron Vance accidentally discovered a talent for carving Bible sticks in 1989. Since then he has carved many sticks to illustrate various aspects of the Bible. Each stick takes about a year to carve. Having seen the pictures, you can understand why. The book has pictures of each stick as well as focusing in on the finer detail. To accompany each stick, Ron Vance describes what he did, what the carving represents and why he used certain colours. The bible sticks are absolutely stunning. The detail is incredible. It is impossible to choose a favourite. Each time you turn the page, a ‘new’ favourite leaps out! So many beautiful examples to admire. Bible Sticks would make a perfect addition to any bookshelf. It would also be a perfect study aid for life groups. You could spend hours looking at these beautiful sticks and still spot something new. This really piqued my interest! What a creative way to bring the Bible to life. I love how his talents were an “accidental” discovery. God is awesome when He trips us into our calling. We can never be more creative than God. I will be checking this book out!